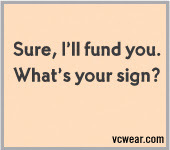 OK, this made me laugh: VC Wear is a site put together by a couple of Boulder, CO dudes. They apparently sell t-shirts that only VCs get (like the one you see here). The t-shirts are either really funny or I’m really lame, or both. They have the audacity both to charge $100 for their t-shirts and to offer their entire “company” for $100K. I love it. You can check out their VC presentation here. Feel free to buy a t-shirt, but don’t use this pitch as a model for your own. And don’t wear one of their t-shirts to a VC meeting. Unless you don’t need the money, in which case – go for it!